With the Metro construction blanketing almost all of Delhi, this is a usual scene on Delhi roads these days. I must say, the people managing the construction of the Metro are doing a fantastic job considering that they are spread through some of the most important roads of the city, yet they manage the traffic quite well and I have never spotted dirt on the part of the road where the construction is not happening. I left Delhi in 1998 and though I was happy to go to newer places but now I am already craving and dying to come back to my home, saadi dilli. Please keep posting the pics of delhi and delhites. BTW, i was sometime back wondering if there would be those water selling carts (50p per glass of cold water) at bus stops and one of your pics told me that they still exist. I guess now they must be found outside the metro stations rather than the bus stops! Thanks again for make me relive my city! You mean "metro' as in "subway"? good to know that they are taking their jobs seriously and doing their bit towards keeping your city clean! 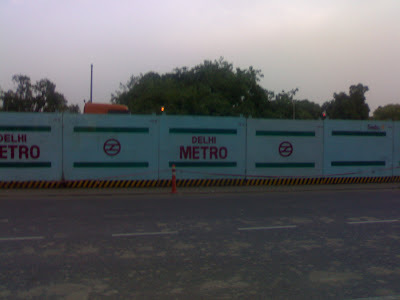 hope the mumbai metro construction guys will learn something from delhi!